Let The Christmas Cookie Countdown Begin! 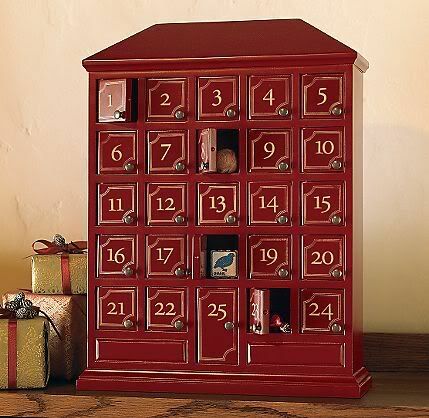 Last year, we finally bought a wooden advent calendar. We had been wanting a particular one for several years and just couldn't bring ourselves to spend the money on it. And, there were never any left during the post-Christmas sale. But one day last February, I was strolling through the store that carried the advent calendar we wanted, and sitting underneath a clearance table labeled "75% off" was a brand new, boxed advent calendar - the one we'd be wanting for years. I bought it. And, we love it. Since the boys are really beginning to understand the lessons surrounding Christmas and are feeling the excitement as Christmas day approaches, I wanted to use our advent calendar to do something special with them this year to celebrate this most wonderful season. And, I wanted to do a little something each day - as we count down the days til Christmas. But, I wanted it to be something that was tailored to them. Something that was tailored to our family. Hence, the Short Stop Christmas Cookie Countdown was born. Each day - from now until Christmas - the boys will open up the day's door on our advent calendar and find a new kind of cookie we get to make together. Because well, we love to bake around here - me and my boys. We love covering the kitchen in flour and tasting cookie dough and watching our creations through the oven windows. Did I mention how much we love to eat cookies, too? And, I'll share our recipes with you as we go along! Some of the recipes are my favorites. Some of them are new ones we're gonna try for the first time. Some are easy. Some are more involved. Some are prepackaged. Some are made from scratch. So, if you're looking for some new cookie recipes this year, you've come to the right place. Oh my land. I'm giddy with pre-sugar excitement. I LOVE when people bake cookies. Twenty five, huh? That's a record. My Mom baked 17 kinds one year. Whew! You go, girl! BTW-- Cool way to fill the advent calendar! And way to go on the bargain shopping! 25 ways to be AWESOME. You rock, Sarah!! great and delicious idea. Enjoy the time with the boys--while they're still all home during the day; I miss Johnathan being at home with us as we're doing fun stuff. wowza. I wish I had your enthusiasm and energy. Bake on. Love the advent calendar! We broke ours out the other day too. 25 days of cookies, huh? How about 25 days of Schmike family visits? LOL! I love your advent calendar! Did it come with anything inside the windows or do you add your own? (obviously I know you added the cookie idea). Now I REALLY wish you lived closer...YUM! i love your advent calendar. i have been looking for something similar but haven't wanted to pay the price for it. you found a great deal. Yes where did you get that beautiful calendar!? !